East Fremantle Football Club enjoyed another successful day at Shark Park, winning both the League and Reserves games and only falling short by four points in the Colts. Thanks to the the generosity of our supporters, players, staff and sponsors - particularly Bendigo Bank - we raised $4,600 for the Batten Disease Support and Research Association! Thank you to everyone who donated and participated and thank you to the Halley Family for joining us. THE MEMBERS' DRAW HAS NOW JACKPOTTED TO $3250! THE MEMBERS' DRAW HAS NOT JACKPOTTED TO $3250! The Friday night Member's Draw has jackpotted to $3250 and you must be there to collect it. On Friday night, June 6th Alan Rummer’s name was drawn out but he wasn’t in attendance to collect the jackpot of $3200, so the draw has now jackpotted to $3250. Harry Morgan; John Wheelock; Michael Malaxos; Tony Johnson; Bruce Dalziell; Malcolm Dobson; Christopher Reidy; John Ritchie; David Fardon; Michael Cuneo; David Fienberg; Jim Watson; Glen Quartermain; Steven Cowin; Carmelo Zagami; Matthew Preedy; Jack Perham; Alice Potter; Lachlan Blight; John Bowker. 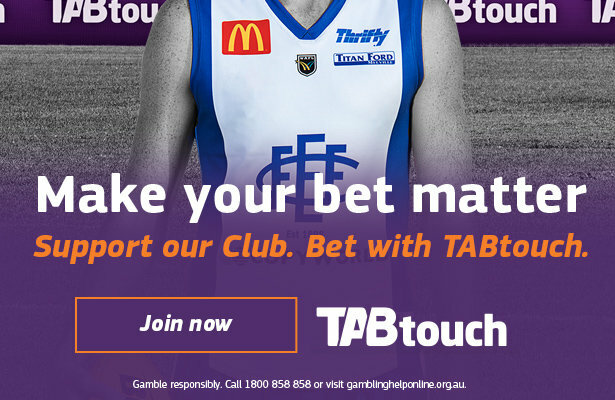 The East Fremantle Football Club, along with Major Partner Bendigo Bank, will be supporting Batten Disease awareness on Saturday June 7th in our Round 11 Bendigo Bank Cup clash with Peel Thunder at East Fremantle Oval. The East Fremantle Football Club celebrated WA Day with hard fought wins in all three grades against arch rivals South Fremantle at Fremantle Oval. THE MEMBERS DRAW HAS NOW JACKPOTTED TO $3200! The Friday night Member's Draw has jackpotted to $3200 and you must be there to collect it. On Friday night, May 30, Enzo Simeone’s name was drawn out but he wasn’t in attendance to collect the jackpot of $3150, so the draw has now jackpotted to $3200. The Board of Directors of the East Fremantle Football Club announced to the members on Friday May 30th that the Club will investigate the opportunity to co-tenant Fremantle Oval with the South Fremantle Football Club. The East Fremantle Football Club (EFFC) is recognising Reconciliation Week (27 May – 3 June) by holding the first meeting of its Reconciliation Action Plan (RAP) working group, launching its NAIDOC Guernsey Design Competition, and offering their 2013 NAIDOC Jumpers for sale to the public for the first time.